I had some leisure this past weekend to try to push my skills a little bit. 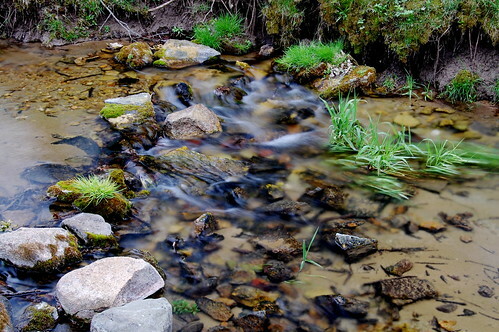 I was camped near a beautiful stream that emerged crystal clear and cold from the side of a hill. A few feet later the stream is five or six feet wide and home to watercress and not too much else. Less than a quarter mile downstream it becomes home to some nice brook trout. This shot is taken at a bend quite near the head and the rocks make a pleasant splishing sound that is nicely relaxing. 200 ISO, 1.6 seconds at f/13 using a tripod and remote trigger. An ND4 neutral density filter was used as well. This is probably the finest photo I have ever taken. it is amazing, N... I now have it as my desktop background. Centered, against black - beeyooteefull. Actually I like your "Softly Falls the Water", much better.